View our selection of livestock scales here! 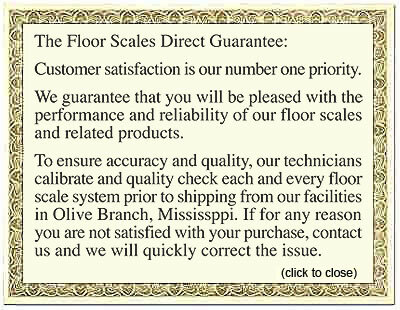 Floor Scales Direct has the highest quality livestock weight scales available on the market. If you need accurate, durable, and dependable livestock scales, our selection has you covered. You will find our newly redesigned livestock scale can hold an animal up to 5,000 lbs. This high weight tolerance, accuracy, and ease of use is great for getting precise cattle weight in a timely manner. Features of our livestock scale include: heavy duty steel construction, a rust proof galvanized finish, and our Average Weight Hold feature compensates for animal movement. One of the latest features of our livestock scales is the Intelligent Hold system. This system prevents partial-weight hold while animals enter the squeeze chute or platform. Learn more about our large animal scales and our versatile Sk-VET animal scales by clicking on the more info button. You will find features, specifications, applications, and accessories for your scales. Additional accessories include: MP-20 Thermal Printer, the SP-500 Star Roll Printer, and our indicator stand to streamline the weighing process. Don’t forget to check back frequently for outstanding sale prices and special deals when you buy our scales and accessories together. Please contact us with any questions, concerns, or special orders at 1-800-238-0152. We have a floor scale with your name on it!